I often browse the local real estate listings, in search of interesting historic properties. This house, at 2208 East 36th Street, caught my attention recently. According to the listing, it was built in 1860. With all the redevelopment in the Central area, this would make the house one of the oldest in the neighborhood - I had to investigate. Cuyahoga County offers some of the best access to real estate records anywhere. While the County Auditor provides a considerable amount of information about each property and piece of land, the dates that they have for houses are often incorrect - just about everything built before the 20th century is dated as "1900". But when a house is given a date before 1900, it's often correct, or at least close. The Auditor agrees with the date, 1860. The next step would be to trace back the ownership of the house, using the County Recorder who provides online access to property records dating back to 1811. By tracing the transfer history, one might be able to get a better idea as to when the house was built. On my lunch break yesterday, I decided to check it out. The house does, in fact, appear to have been built in about 1860. The one next door, according to the Auditor, was built in 1880. I don't feel completely confident of that number, due to the similarities in shape and style - they might have been built by the same builder. 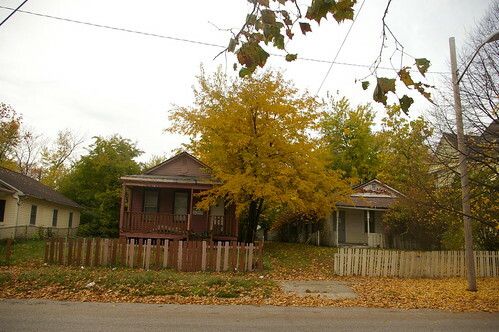 The pitch of 2212 E. 36 is a bit greater and the house is sited closer to the street, both of which would support a later date. An addition was built on the rear of the house at some point, with a second chimney. The house is bank owned. Architecturally, it isn't especially impressive. The interior has that lovely 1970s faux wood paneling. It's small - 795 square feet. As an example of what a large part of Cleveland used to look like, it is significant. 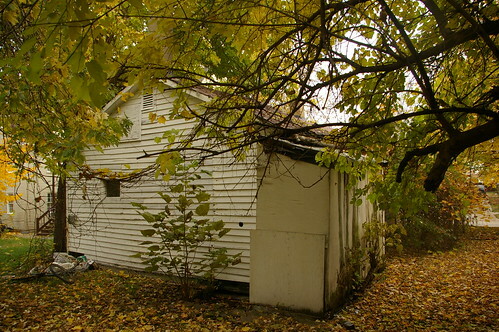 Due to the small size of the house and simplicity of the roof, it wouldn't be a terribly expensive house to rehab, even though it clearly needs quite a bit of work. 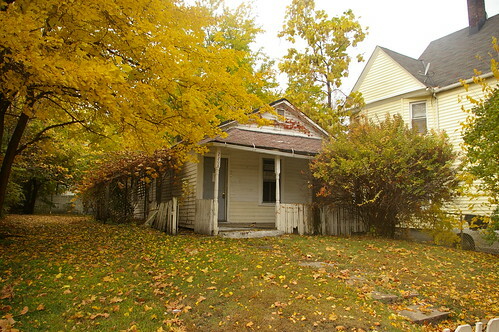 The asking price on the house is $7,000, though you might be able to obtain it for half that. Rehab it as a rental property. Do something with it. Isn't this bit of Cleveland history worth $3500? Save this Greek Revival house!